When the most sympathetic character is a religious fanatic played by Shia LaBeouf, your film may have some issues. 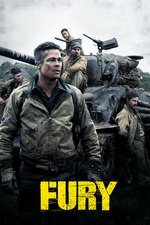 Starring Brad Pitt playing Brad Pitt doing an impression of Brad Pitt playing the gritty leading role in a war movie. Too much 'Look, war is really bloody and bad' combined with 'Ew, look isn't this really gory!'). Basically wanting it both ways. The scene with them sat around a table in the apartment is just so actorly it made me cringe, even in the cinema I could almost hear the self-regarding DVD commentary whining on about ad-libbing and making the characters real. Awful. The final battle scene is ridiculous and letting the no0b escape is just chickenshit script-writing. Pena's rolling on the grenade scene is a study in script writing laziness. I wanted the movie to teach me something about tank warfare... it didn't. You can tell a lot about the level of directing by the little things: When the actors went into the building with all the dead bodies, there was no hint that there might be a smell. I had such conflicted feelings. The opening is great, with the kid cleaning the tank, and then being thrust into battle ("Do your job!"). But this movie really, really needed to come about 20 percent closer to "standard" Hollywood conventions. I mean, would it have ruined the movie to give Brad Pitt's character a rooting interest? Tom Hanks in Saving Private Ryan got to talk about his wife, being a teacher and a baseball coach. This isn't hard to do. You can totally tell this was greenlit as "SPR with tanks and Brad Pitt." Go make that movie. I didn't understand what the point of this film was about. It just seemed so meaningless, and not in the big question sort of way. I wonder what attracted everyone to the script. There just wasn't anything about this which felt like it needed to be told. Maybe this is a MeTa comment? But it's cool, maybe, to hold off on letting everyone know how little you like a movie and let some other folks in to discuss it first. I thought the movie was pretty decent. I liked the homage to The Big Red One, too. And Shia LeBeouf's performance was really pretty great. I thought this was a fine, action-packed war movie. I had no problem with Brad Pitt and Shia LaBeouf was pretty good in his role. The way the tank fire was filmed was particularly spectacular. Thumbs up from me.